Two of the most important pieces of hunting gear combined into one powerful, long-ranging unit, Fury HD 5000 rangefinding binoculars make glassing and ranging ultra-fast and efficient. Right-side button controls make one-handed manipulation of both functions quick and easy, cutting down on set up time in the field. 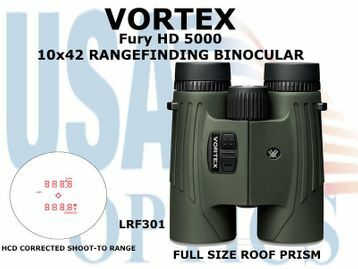 And don't forget - these Fury HD 5000 binoculars join all other Vortex products in that they are completely covered by our unbeatable VIP Warranty, and that includes electronic components! ➢ HD Optical System - Optimized with select glass elements to deliver exceptional resolution, cut chromatic aberration and provide outstanding color fidelity, edge-to-edge sharpness and light transmission. ➢ XR Lens Coatings - Premium anti-reflective coatings on all air-to-glass surfaces provide superior light transmission for exceptional clarity and low-light performance. ➢ Dielectric Prism Coatings - Multi-layer prism coatings provide bright, clear, color-accurate images. ➢ Phase Correction - Coating on roof prism enhances resolution and contrast. ➢ Roof Prisms - Designed to be compact yet durable. ➢ Nitrogen Gas Purged - Gas purged and o-ring sealed for fogproof and waterproof performance in all conditions. ➢ ArmorTek - Ultra-hard exterior lens coatings defend against scratches, oil and dirt. ➢ Shockproof - Designed to withstand the highest levels of recoil and impact. ➢ Waterproof - Designed to withstand harsh weather conditions. ➢ Fogproof - Designed to withstand a wide range of temperatures. ➢ Rubber Armor - Provides a secure, non-slip grip and durable external protection. ➢ Multi-Position Eyecups - Twists to precise, intermediate settings for a customized, comfortable fit with or without eyeglasses. ➢ Tapered Eyecups - Fit naturally for greater viewing comfort. ➢ Left Eye Diopter - Adjusts for differences in a user's eyes. Located by the center focus wheel. ➢ Center Focus Wheel - Adjusts the focus of both binocular barrels at the same time for ultra-sharp views. ➢ Right Side Controls - Simple to use and easily manipulated with a single hand - leaving your other hand free to hold your bow, rifle, or other important piece of equipment. ➢ Tripod Adaptable - Allowing use on a tripod or car window mount. Tripod adapter required. ➢ Horizontal Component Distance (HCD) - Horizontal Component Distance (HCD) mode compensates for incline or decline to display the true distance to the target. ➢ Line of Sight (LOS) - Line of Sight (LOS) mode displays actual line of sight distance to the target. ➢ Scan - This feature displays continual distance readings when panning across a landscape or tracking a moving animal. ➢ Best Mode - Displays the strongest range result. Intended to be the primary mode. ➢ Last Mode - Displays the furthest distance when ranging/panning/scanning. Ideal for ranging targets behind potential obstructive objects in the foreground - like brush, trees and rocks. ➢ Easy-To-Use Menu - Intuitive, easy-to-use menus feature a simple, clean illuminated display. ➢ Ranging Format - Range in yards or meters. ☑ The Fury uses HCD (Horizontal Component Distance) angle-compensated ranging technology to give bow and rifle shooters the critical distance data needed to make accurate shots. Capable of ranging reflective targets to 5000 yards with an ultra-fast readout.